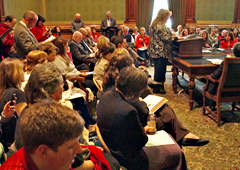 People packed a meeting on reorganization of Iowa government. Dozens of citizens crowded into a meeting room at the statehouse today to air their complaints about a state government reorganization plan that will be debated in the House later this week. A bus load of southwest Iowans was there to tout the Mental Health Institute in Clarinda, a facility that would be downsized under the plan. Holly Maurer of Clarinda told legislators her husband will be forced to drive for hours to get treatment elsewhere if the facility’s outpatient counseling services are shut down. “Removing access to services is telling Iowans that their quality of life isn’t valued by our state government or those that we elect to represent us and be our voice,” Mauer said, her voice breaking as she struggled to hold back her tears. Ann Davison, a nurse who works at the Clarinda Mental Health Institute, said the institute has been modernized and is far from being an “insane asylum.” According to Davison, Clarinda’s geriatric unit is the highest rated in the state. “I recognize your mission of must-needed budget cuts is not an easy one, nor is it taken lightly,” Davison said. “We pray for your independent thinking and to recognize not only the financial facts, that Clarinda costs less to serve this population, but also the human element in it all.” Several others who testified at this morning’s public hearing complained about a proposal to change oversight of a state-paid preschool initiative. The room was so crowded, one woman who drove to Des Moines from Washington, Iowa, had a hard time getting to the microphone to testify. Representative Mary Mascher, a Democrat from Iowa City, was the hearing’s leader. “Tasha, we might have to body pass you to get you over here,” Mascher said. “Could folks let her through, please?” Mascher and other members of the House State Government Committee sat at a table as a crowd of over 160 sat on chairs, sat on the floor, or stood for the two-hour hearing. Iowans for Tax Relief president Ed Failor, Junior, told the panel of legislators their reorganization plan was a “great start,” but only a start. Organizers say about 60 people made the trip from southwest Iowa to Des Moines today to lobby on behalf of the Clarinda Mental Health Institute.